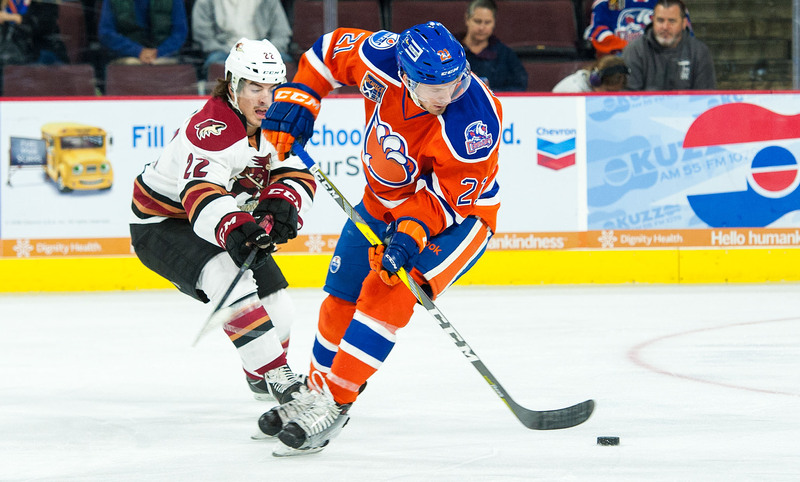 Chris Mueller’s redirect tally with 15 seconds left on the clock Saturday night almost saw the Roadrunners pull off a stunner, but overtime told a different story in Tucson’s 3-2 loss to the Bakersfield Condors at Rabobank Arena. A tough ending, but impressive nonetheless. The overtime loss still credits a standings point to the Roadrunners, who have now earned at least one point in each of their previous nine games (7-0-2-0). Tucson’s only regulation defeat came on October 14 in their first game of the season. Saturday night’s point earned goes a long way in keeping the Roadrunners atop the American Hockey League standings, their .800 win percentage still the best of the 30 teams. Tucson played from behind for most of Saturday’s affair after Bakersfield’s Taylor Beck, who was assigned to the Condors Saturday morning from the Edmonton Oilers, potted a pair of first period goals. In the second period, the Roadrunners came out buzzing, albeit no goals were to show for their control of the contest during the middle frame, where they outshot the Condors 17-3 – surrendering very little time or space to Bakersfield’s offensive corps. The Roadrunners finally put a puck past Laurent Brossoit with just over 11 minutes left in regulation when Brendan Perlini whistled home his team-leading sixth goal of the campaign. Upon yet another gorgeous zone entry conducted by Chris Mueller and Craig Cunningham, Mueller found Perlini with a soft feed as he opened up and awaited the puck atop the right circle. Perlini’s shot beat Brossoit high to the glove side. Desperate during the final moments of regulation, the Roadrunners pulled goaltender Adin Hill en lieu of an extra attacker. As the final seconds ticked off the clock, Tyler Gaudet found Craig Cunningham with a pass in the high slot. Cunningham fired a one-time shot into a flurry of traffic which Chris Mueller got a stick on, redirecting the puck past Laurent Brossoit to tie the game with 15 seconds left. The first line trio of Perlini, Cunningham, and Mueller have been red-hot lately. Cunningham now has points in four-straight games (6A), as does Perlini (4G, 1A). Mueller has points in three straight (1G, 4A). 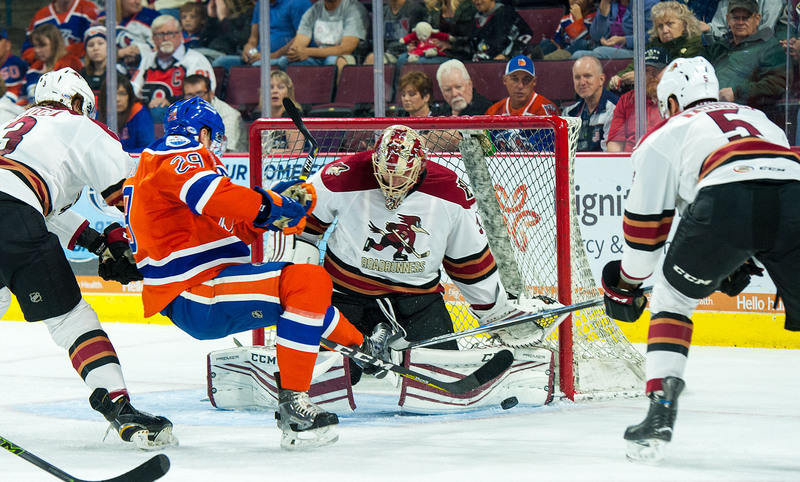 The Roadrunners entered their fourth overtime of the season Saturday night. They compiled a 2-1 record in their first three sudden death occasions. Craig Cunningham had a glorious chance to score in overtime on a breakaway opportunity, but was turned away by a blocker save. The Condors transitioned immediately afterward, and Josh Currie walked in alone to beat Adin Hill to secure a 3-2 win for Bakersfield. Chris Mueller (1G, 1A) and Craig Cunningham (2A) led all Roadrunners players in points scored (2); Adin Hill made 16 saves in the OT loss. The Roadrunners will now return home for a season-long six-game home stand, which begins Friday night when they host the Manitoba Moose at Tucson Arena for a 7:05 PM MST scheduled start. Tickets for both games against the Moose on Friday, November 18 and Saturday, November 19 can be purchased below. $2 beer and $1 concession specials will be offered during the two games.